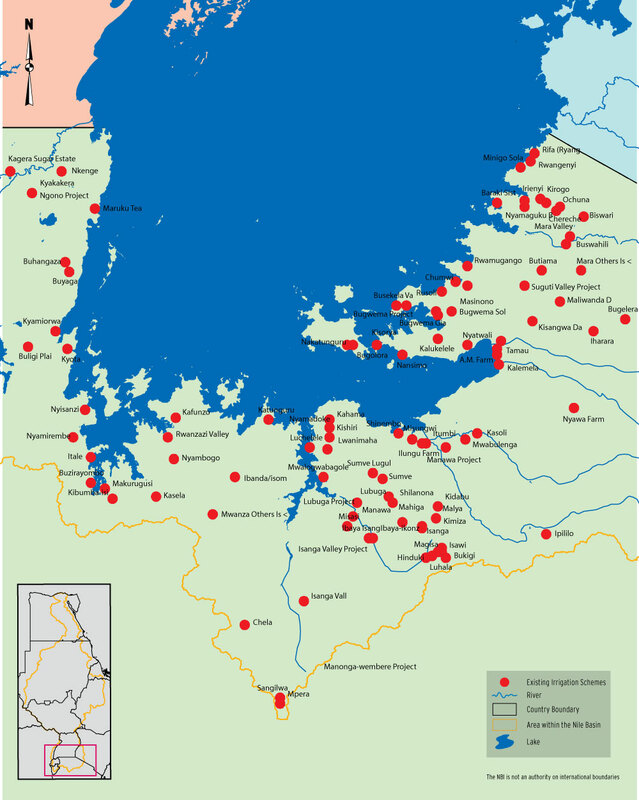 There are approximately 64 schemes of irrigation with a total area of 19,753 ha in the Nile Basin parts of Tanzania. Most of the schemes are less than 200 ha and only 7 schemes have areas 1000 ha or greater. Main crops in most irrigation areas are maize, beans, rice and vegetables. Almost all schemes are gravity-fed (99%) from surface sources with the remainder using pumps for water abstraction. Surface irrigation is practiced widely using furrows and basins with conveyance by both lined and unlined canals. Sprinkler irrigation is used by a few largescale commercial farms with drip rarely used except on pilot schemes run by Government or in small-scale water harvesting. The main irrigated crops are paddy and maize, accounting for about 48% and 31% respectively of the irrigated areas in 2002. Other irrigated crops account for 44% of irrigated areas with an average cropping intensity of 123%. More recently government has been implementing irrigation schemes based on traditional rainwater harvesting technologies together with storage dams. The average annual irrigation water demand is estimated at 102 MCM. The estimated annual volume of water used for irrigation is 63 MCM, which is about 62 percent of the annual irrigation water demand. The major challenges to improved agricultural growth through irrigation as identified by the Ministry of Agriculture in the 2012 include (i) developing new sources of growth in response to markets, (ii) increasing farm productivity, (iii) improving agribusiness and processing to enhance rural employment, (iv) establishing producer incentives for export and food crops, (v) fostering the participation of the rural poor in agricultural growth and development, (vi) enhancing the sector investment climate, and (vii) improving public expenditures in the sector.